Which version of fern WiFi cracker are you using ?? 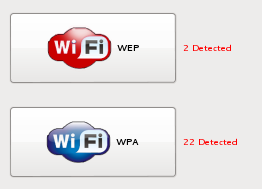 I cracked wep but failed on WPA. I was using version 1.9, you can this blog post on updating the program and a few of the issues I had using Fern. Thanks for the comment! Correct… as I mentioned in the article I used a simple passphrase and was sure it would be found fast. It has been years since I have done any wireless pentesting and used some of these tools… some of these tools can be very temperamental, and a generic message of something is not working does not give me much to go on to provide any assistance. If there is a specific error message or behavior that is happening you can Google that for clues… Google was my best friend in similar instances when I would run into issues! 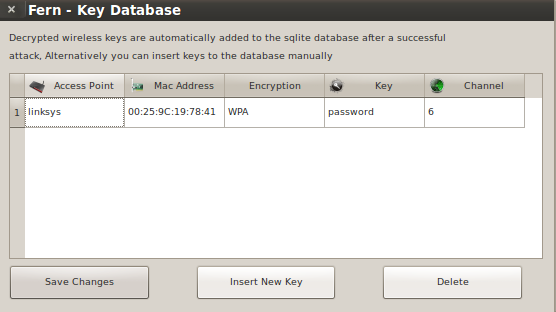 Correct… as I mentioned in the article I used a simple passphrase and was sure it would be found fast. Your comments were not deleted, all comments to the blog have to be approved before being posted. Thanks! i’d like to ask, so what if the password is not in the list does this mean that it cannot be cracked? 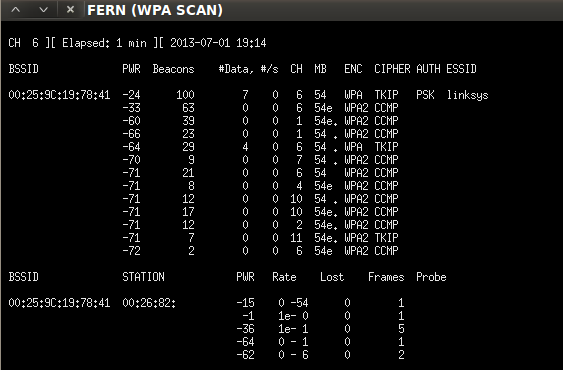 Exactly… If the WPA passphrase is not in the word list being used by Fern then it won’t crack it. That is why it is important to not use a common dictionary word or an easily guessed passphrase. Thanks for the question! Ok so my next question is how exactly do I create a good and uncommon dictionary word list? Or should I say how do I create a dictionary on the whole? Great question, and I haven’t created any custom word lists and have just been using the word lists that come with Fern or one of the other utilities in Backtrack. I do believe there is a utility in Backtrack called genpmk that can create WPA hash tables or word lists, but I have not messed with it. This might be a topic I can try to write about in the future, but in the meantime you can Google search and see if anyone else may all ready have instructions on genpmk. Sorry I could not give you a better answer. Latest release shows v1.6, from where to download v1.9? I am using Backtrack5r3, its already have v1.6 installed, what’s the difference between both versions? Hi Syed, When you open the program look in the lower left corner and if any update is available a message and button should be active to download and install the update. Not much difference in versions… the later version addresses bug fixes and helped me with the program locking up or freezing. For anyone new to Fern the best place to start is the Google project page. Along with some general info it has install, update, and usage instructions. There is a large word list available for download from the Hak5 site. Knowing the commands and switches is a good skill to master, but Fern’s point and click GUI is slick and easy to use, which makes it scary when people with lesser skills use it for not so good intentions! how to creat a word list ?? Kali has a utility called Crunch that can be used to create custom word lists. Here is a link to an article that explains how to use the Crunch utility. Hi Sir! Could you tell me please, how much time does Fern WIFI Cracker takes if I bruteforce WPA encryption with WPS flaw in condition of processing power 2.2 Ghz dual cored AMD Turion microprocessor? 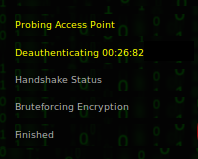 While I was cracking WPA with dictionary attack on Airocrack-ng it shows 500 words per second. Can I guess same indications on Fern Cracker or is it cracks less combinations because my microprocessor is generating them? Do you have some articles about WPS cracks and How it works on Fern WIFI Cracker? Fern is a GUI interface and uses the Reaver utility to crack the WPS flaw. I used the Reaver utility and usually run into issues as most APs notice the repeated tries of pins and stop answering the requests. There are settings to control asking a new pin less frequently to trick the AP, but many successful attacks with Reaver take hours, and I look at other attacks before Reaver since I get impatient with Reaver! Fern and some of the other WiFi tools can be a challenge at times to get to work! I went through a lot of issues with Fern, and the power of Google is your friend to research any issue! It could be anything from your WiFi adapter is not able to do all the functions, or the install may be corrupt, or a config setting may be set wrong. Please post any error messages or more details of your issue and I can try to help diagnose what the issue is.